Tom Vovers is the founder and General Director of HR2B. HR2B began life in 2003 in the lounge room of my house with one staff member. The idea was to bring human resources management practices to Vietnamese organisations. Back then our core business was mangement consulting, however, clients kept coming to us with the same need, to find them talented Vietnamese managers and professionals who would add value to their business. In July 2003 HR2B began Executive Search Service with a staff of two professionals and version 1.0 of our Executive Search and Selection Information System (ESSiS). Our focus was on General Director / Director level positions. Our first ‘multi-job' client was Avon (Vietnam) Ltd where we placed 5 out of 7 directors against stiff competition from Ernst and Young. By the end of the year we had picked up Metro Cash and Carry and AIG (AIA) Life insurance as multi-job clients. 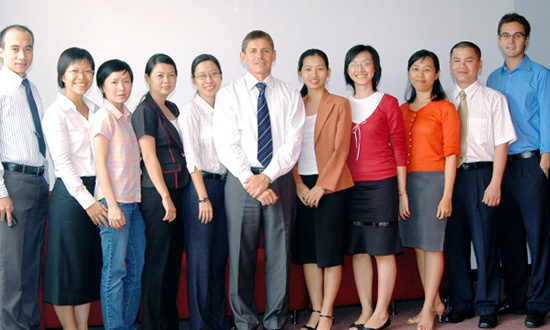 During 2004 we continued to add international clients such as Coca Cola, DHL, Unilever and Prudential and began to serve large Vietnamese organisations such as FPT, Sovico, Thien Long Pen and Dong Tam ceramic company. View more about HR2B service of Executive Search in Vietnam. By 2005 HR2B had nearly 100 customers and we were growing in the IT, Telecoms and Banking industries. In order to serve these clients HR2B established the HaNoi office with 2 staff sharing a desk. Now HR2B is in an A grade building with 15 staff. HR2B began Payroll Processing in 2006 and our first customer was the Swinburne University with 4 payees in Ho Chi Minh City. Now the payroll team has over 20 staff serving 40+ clients and thousands of payees nationwide. View more about HR2B Payroll services in Vietnam. Veyance, Spraying Systems and LinkSys were HR2B first Staff Outsourcing customers. Originally an extension of our Payroll Processing service, Staff Outsourcing is now a separate team. This professional HR service gives our customers flexibility in hiring. HR2B handles all the contract administration and payments. View more about HR2B service of Staff Outsourcing in Vietnam. In 2010 HR2B acquired the local company MeKong International Services (MIS) from a competitor. MIS expanded the Staff Outsourcing customer list by 600% and allowed HR2B to build up this service faster than we could have done with organic growth. The customer services team from MIS joined with the HR2B team, expanding our ability to serve customers large and small. HR2B made it's first placement in DaNang with AIA life insurance company in 2004. By 2012 the demand from the central economic zone was increasing to the point where we decided to open an office there. HR2B DaNang opened in October 2012 and the first placement from the team there was a position with VBL in December 2012. In March 2013, HR2B became the Viet Nam office of IRC International Search Partners. This unique partnership of over 70 offices in 35 countries and 250+ consultants, gives HR2B customers global reach when requesting very high level retained search services. In the last 10 years HR2B has grown from being a small company run from my home, to a large talented organisation with over 70+ staff and three offices. There have been a lot of changes. The thing that has not changed is HR2B service pledge to our customers which is in every contract, and an integral part of our staff training. "HR2B wishes to maintain a long-term relationship with you. We guarantee to carry out the work described above and to help sort out any additional problems that may arise." HR2B is committed to continue to provide Viet Nam with world class professional services in the area of Human Resources Management.